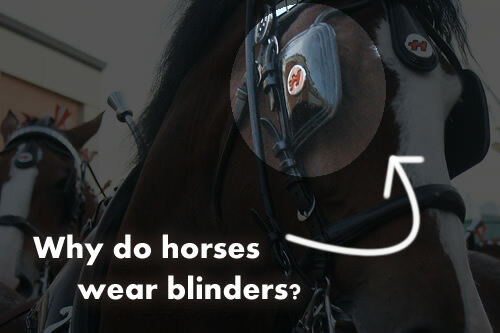 Blog Why Do Horses Wear Blinders? Horses have their eyes at the sides of their heads, which indicates that they are hunted in nature — similar to rabbits, for example — as opposed to the hunters such as cats. So, horses have peripheral vision, which means they can end up running off course unless they are made to remain focused. Horses sometimes need to be made to focus and blinders keep the horse’s eye focused on what is ahead, rather than what is at the side or behind. That is why race horses are often given blinders – for the purpose of keeping them focused when racing round a racecourse. The jockey has a very small amount of control over the horse. If a horse decides to take a different route, it will simply take the jockey with it, so this can pose problems. Troublesome race horses are fitted with blinders for their own safety and the jockey’s safety. Carriage racing or harness racing are common equestrian sports where horses are pulling carts, carriages or wagons while racing. The horse’s legs are hampered by harnesses, which prevent them from galloping. Instead, the race is won by the horse that can trot the fastest. For many horses, blinders are commonly used in order to prevent the horse from becoming distracted. Farming horses can also be predisposed to distractions and if they are pulling a plow or a wagon they might need blinders to stop them from losing concentration on the direction they are supposed to be headed. The blinders cover the rear vision of the horse, forcing it to look only in a forward direction and keeping it on track. Blinders are also useful to reduce the chances of the horse being spooked and making a run for it while still attached to the wagon.